In the enchanting setting of the Gulf of Biodola, a stone's throw from the renowned Biodola Beach and amidst one of the Island most sought-after location. 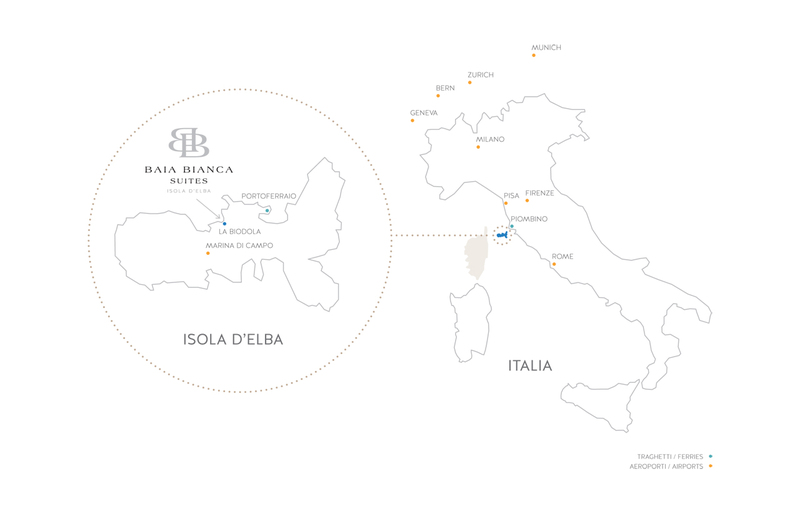 This is Baia Bianca Suites, with its holiday apartments and suites. 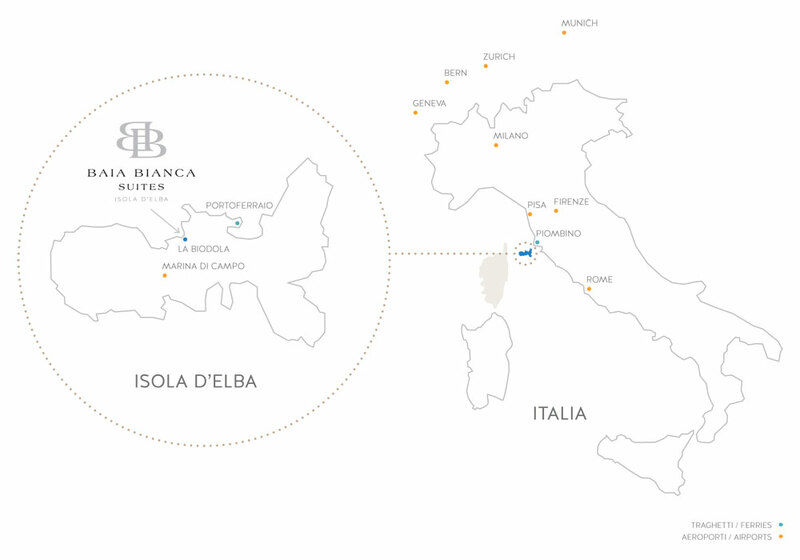 There are many ways to arrive at Baia Bianca Suites: air, train, car or ferry are amongst the choices. From the Pisa airport to the ferry in Piombino is less than 1 hour drive. There are several options for ferry boats from Piombino which takes from 30 to 60 minutes to get to Portoferraio (We recommend Corsica Ferries which takes 30 min or Moby, Toremar and Blu Navy). The ferries run quite frequently and you can cross the water with or without a car. Once you arrive in Portoferraio, it's a 10 minute drive to Baia Bianca Suites which offers convenient and free on-site parking. We can also arrange to have you picked up in Portoferraio. La Pila airport at Marina di Campo has direct flights, during the summer months, from/to: Friedrichshafen, Geneva, Munich and Zurich with Intersky; Pisa, Florence, Milan Linate and Lugano with SILVER AIR; Bern with Skywork. Upon request, we can organize a private plane for 4-6 people. Silver Air: All guests staying at Baia Bianca Suites can take advantage of free parking at Jet Park, both Lugano and Milan Malpensa. Contact us now for bookings and info. From Pisa Galileo Galilei airport you will reach the port of Piombino in about an hour from Fiumicino airport to Rome in about two and a half hours. Baia Bianca Suites arranges private transfers on request.